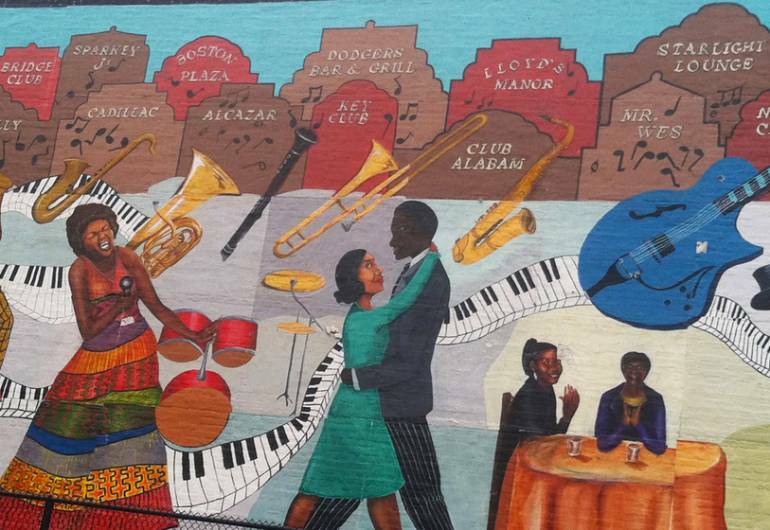 Newark Jazz Clubs were fueled Newark's nightlife from the late 1920s to the 1950s. It was a stopover between New York City and Philadelphia and many great jazz entertainers took to the stage. During the Depression, the clubs provided jobs and launched careers for many local entertainers of color. In the mural, the clubs are represented symbolically because so many of the original structures are gone. The artists attempted to give the viewer a glimpse of the jazz era fashion showing the zoot suit and the conked hair, and features Newark native Sarah Vaughn. The legacy of the jazz clubs lives today with the TD James Moody Democracy of Jazz Festival, WBGO concerts & Newark Public Radio, and also Saturday nights in Baraka's Blues People, and Barbara Kukla's SWING CITY. Lead Muralist Gladys Grauer, Assistant Muralist Melanie Stokes - Additional Artists and NewarkWORKS students include: Yasmine DeJesus, Malik Hardaway, Onnie Strother, Nicole Thompson, Lee Johnson, Larry Hilton, Cheryll Fowler and Kaela Berdecia.